Comp-Tac, maker of competition and concealment gear, is having a 20% Off Sale on July 4, 2011. Save 20% on your purchase by entering the code “JULY-1776″ in the “Coupon Redeem Code” box when you “check-out” from Comp-Tac’s webstore. Comp-Tac offers a wide assortment of firearms accessories. Primarily known for their Minotaur MTAC hybrid Kydex/leather holster, Comp-Tac produces more than just holsters. This company also makes AR-15 Mag Pouches, Gun Belts, Light Holders, and much more! CLICK HERE to view all products and shop online. 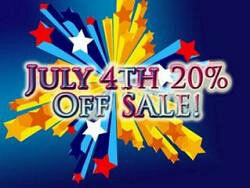 This Fourth of July 20% Off Sale is only available Monday, July 4th. To see full instructions and limitations of this sale, CLICK HERE. Share the post "20% July 4th Sale Today on Comp-Tac Gear"